Gearbox Software has officially announced and detailed the third and "largest" helping of downloadable content for its popular shooter RPG Borderlands, the level cap raisin' "Secret Armory of General Knoxx." 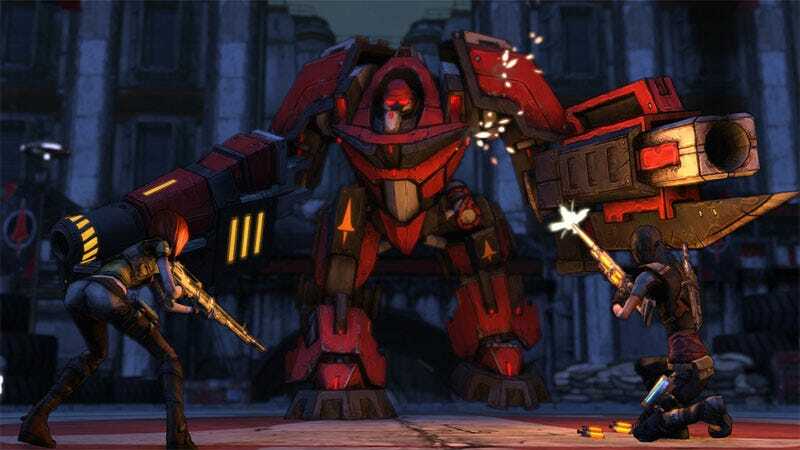 Gearbox and 2K promise "brutal, never-before-seen enemies in a huge new environment complete with tons of brand new missions" as well as "entirely new weapons and items" in The Secret Armory of General Knoxx. The next Borderlands expansion will, as previously promised, also raise the level limit from 50 to... a number larger than 50. The Secret Armory of General Knoxx appears to be tailored to challenge players "from around level 34 to level 50" according to Gearbox's announcement. The developer did not date or price the expansion, which is due for PlayStation 3, Xbox 360 and PC. But it did provide two screen shots! Here's the second.